"Al-Jazari" redirects here. For other people with the name, see al-Jazari (surname). Badīʿ az-Zaman Abū l-ʿIzz ibn Ismāʿīl ibn ar-Razāz al-Jazarī (1136–1206, Arabic: بديع الزمان أَبُو اَلْعِزِ بْنُ إسْماعِيلِ بْنُ الرِّزاز الجزري‎, IPA: [ældʒæzæriː]) was a Muslim polymath: a scholar, inventor, mechanical engineer, artisan, artist and mathematician. 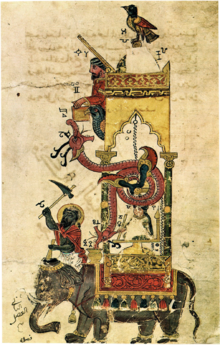 He is best known for writing The Book of Knowledge of Ingenious Mechanical Devices (Arabic: الجامع بين العلم والعمل النافع في صناعة الحيل‎) in 1206, where he described 100 mechanical devices, some 80 of which are trick vessels of various kinds, along with instructions on how to construct them. Al-Jazari was part of a tradition of artisans and was thus more a practical engineer than an inventor who appears to have been "more interested in the craftsmanship necessary to construct the devices than in the technology which lay behind them" and his machines were usually "assembled by trial and error rather than by theoretical calculation." His Book of Knowledge of Ingenious Mechanical Devices appears to have been quite popular as it appears in a large number of manuscript copies, and as he explains repeatedly, he only describes devices he has built himself. According to Mayr, the book's style resembles that of a modern "do-it-yourself" book. The most significant aspect of al-Jazari's machines are the mechanisms, components, ideas, methods, and design features which they employ. In 1206, al-Jazari invented an early crankshaft, which he incorporated with a crank-connecting rod mechanism in his twin-cylinder pump. Like the modern crankshaft, al-Jazari's mechanism consisted of a wheel setting several crankpins into motion, with the wheel's motion being circular and the pins moving back-and-forth in a straight line. The crankshaft described by al-Jazari transforms continuous rotary motion into a linear reciprocating motion, and is central to modern machinery such as the steam engine, internal combustion engine and automatic controls. We see for the first time in al-Jazari's work several concepts important for both design and construction: the lamination of timber to minimize warping, the static balancing of wheels, the use of wooden templates (a kind of pattern), the use of paper models to establish designs, the calibration of orifices, the grinding of the seats and plugs of valves together with emery powder to obtain a watertight fit, and the casting of metals in closed mold boxes with sand. According to Donald Hill, al-Jazari described several early mechanical controls, including "a large metal door, a combination lock and a lock with four bolts." Segmental gears first clearly appear in al-Jazari, in the West they emerge in Giovanni de Dondi's astronomical clock finished in 1364, and only with the great Sienese engineer Francesco di Giorgio (1501) did they enter the general vocabulary of European machine design. al-Jazari's hydropowered saqiya chain pump device. The first known use of a crankshaft in a chain pump was in one of al-Jazari's saqiya machines. The concept of minimizing intermittent working is also first implied in one of al-Jazari's saqiya chain pumps, which was for the purpose of maximising the efficiency of the saqiya chain pump. Al-Jazari also constructed a water-raising saqiya chain pump which was run by hydropower rather than manual labour, though the Chinese were also using hydropower for chain pumps prior to him. Saqiya machines like the ones he described have been supplying water in Damascus since the 13th century up until modern times, and were in everyday use throughout the medieval Islamic world. Al-Jazari's suction piston pump could lift 13.6 metres of water, with the help of delivery pipes. This was more advanced than the suction pumps that appeared in 15th-century Europe, which lacked delivery pipes. It was not, however, any more efficient than the noria commonly used by the Muslim world at the time. Al-Jazari built automated moving peacocks driven by hydropower. He also invented the earliest known automatic gates, which were driven by hydropower, created automatic doors as part of one of his elaborate water clocks, and invented water wheels with cams on their axle used to operate automata. According to Encyclopædia Britannica, the Italian Renaissance inventor Leonardo da Vinci may have been influenced by the classic automata of al-Jazari. One of al-Jazari's humanoid automata was a waitress that could serve water, tea or drinks. The drink was stored in a tank with a reservoir from where the drink drips into a bucket and, after seven minutes, into a cup, after which the waitress appears out of an automatic door serving the drink. Pulling a plug on the peacock's tail releases water out of the beak; as the dirty water from the basin fills the hollow base a float rises and actuates a linkage which makes a servant figure appear from behind a door under the peacock and offer soap. When more water is used, a second float at a higher level trips and causes the appearance of a second servant figure – with a towel! Al-Jazari's work described fountains and musical automata, in which the flow of water alternated from one large tank to another at hourly or half-hourly intervals. This operation was achieved through his innovative use of hydraulic switching. One of al-Jazari's candle clocks. Al-Jazari's candle clock also included a dial to display the time and, for the first time, employed a bayonet fitting, a fastening mechanism still used in modern times. Al-Jazari's largest astronomical clock was the "castle clock", which was a complex device that was about 11 feet (3.4 m) high, and had multiple functions besides timekeeping. It included a display of the zodiac and the solar and lunar orbits, and an innovative feature of the device was a pointer in the shape of the crescent moon which travelled across the top of a gateway, moved by a hidden cart, and caused automatic doors to open, each revealing a mannequin, every hour. Another innovative feature was the ability to reprogram the length of day and night in order to account for their changes throughout the year. Another feature of the device was five automata musicians who automatically play music when moved by levers operated by a hidden camshaft attached to a water wheel. Other components of the castle clock included a main reservoir with a float, a float chamber and flow regulator, plate and valve trough, two pulleys, crescent disc displaying the zodiac, and two falcon automata dropping balls into vases. Al-Jazari's castle clock is considered to be the earliest programmable analog computer. 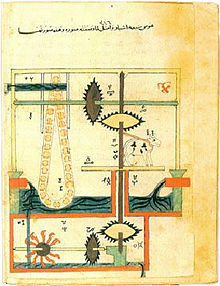 Al-Jazari invented water clocks that were driven by both water and weights. These included geared clocks and a portable water-powered scribe clock, which was a meter high and half a meter wide. The scribe with his pen was synonymous to the hour hand of a modern clock. Al-Jazari's famous water-powered scribe clock was reconstructed successfully at the Science Museum, London in 1976. A sketch of a device designed by al-Jazari. From the manuscript of Kitabal Al-Hial in Aga Khan Museum, Toronto. 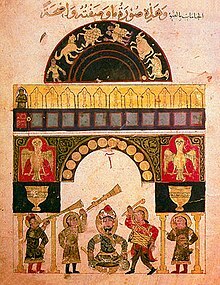 ^ a b al-Jazari, The Book of Knowledge of Ingenious Mechanical Devices: Kitáb fí ma'rifat al-hiyal al-handasiyya, transl. & anno. Donald R. Hill. (1973), Springer Science+Business Media. ^ Beckwith 1997, p. 290. ^ Marco Ceccarelli, ed. (2010). Distinguished Figures in Mechanism and Machine Science - Part 2. Springer. pp. 1–21. doi:10.1007/978-90-481-2346-9. ISBN 978-90-481-2345-2. ^ pp. 32–33, The Origins of Feedback Control, Otto Mayr, MIT Press, 1970, ISBN 0-262-13067-X. ^ a b c Paul Vallely, How Islamic Inventors Changed the World, The Independent, 11 March 2006. ^ Hill 1998, p. 231–232. ^ Donald Hill, "Engineering", in Roshdi Rashed, ed., Encyclopedia of the History of Arabic Science, Vol. 2, pp. 751–795 . Routledge, London and New York. ^ Hill 2013, p. 150. ^ Ahmad Y. al-Hassan. "The Origin of the Suction Pump: al-Jazari 1206 A.D." Archived from the original on 26 February 2008. Retrieved 16 July 2008. ^ Hill 2013, pp. 143. ^ Hill 2013, p. 150-2. ^ "al-Jazari". Encyclopædia Britannica. 2009. Retrieved 4 October 2009. ^ Professor Noel Sharkey, A 13th Century Programmable Robot (Archive), University of Sheffield. ^ a b Ibn al-Razzaz Al-Jazari (ed. 1974) The Book of Knowledge of Ingenious Mechanical Devices, Translated and annotated by Donald Hill, Dordrecht / D. Reidel, part II. ^ Hill 1992, pp. 57–59. ^ Salim Al-Hassani (13 March 2008). "How it Works: Mechanism of the Castle Clock". FSTC. Retrieved 6 September 2008. Hill, Donald (2012). The Book of Knowledge of Ingenious Mechanical Devices: (Kitāb fī ma 'rifat al-ḥiyal al-handasiyya). Springer Science & Business Media. ISBN 978-94-010-2573-7. Hill, Donald R. (2008) [1970-80]. "Al-jazarī, Badīʿ Al-zamān Abū'l-ʿizz Ismāʿīl Ibn Al-razzāz". Complete Dictionary of Scientific Biography. Encyclopedia.com. Wikimedia Commons has media related to al-Jazari.